If you haven’t been on a bike in awhile, or even if you’re an avid cyclist, you might have considered looking into a “cruiser”. Rather than dropping a bundle on a high-end mountain bike or road bike, you can get comfort, style and fitness in a lower-priced package. 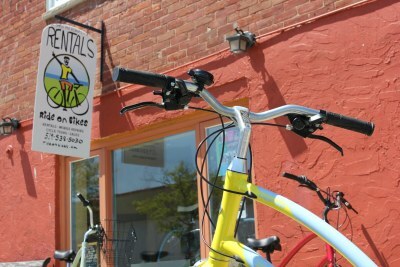 And now, Meaford has it’s own dealer of Elektra brand cruisers, comfort bicycles and hybrids at Ride On Bikes. Not ready to buy yet? Try one out. You can rent one of these popular bikes and set off on your own, or join one of the guided tours the new store is offering. The original cruisers were the most popular bikes in North America from the 1930s through the 1950s, then after a 30 year slump, they started making a comeback among baby boomers and retirees about 15 years ago. Elektra, launched in 1993, is one of the main companies credited with the resurgence of the cruiser. Cycling had always been a huge part of Paul’s life. He was a mechanic for various retailers, and he worked in Sporting Life’s shop from their opening. He also raced criteriums for Duke Cycle, started their racing team in the 1980s, and toured through Europe on bikes. “I’m a huge cyclist,” he says. A few years back, Paul met Janet Perks, Meaford born and bred, and four years ago, the Toronto native found himself moving in with Janet to her family farm. “All of a sudden, I’m living on a 100-acre farm and driving a tractor,” he says. All he needed to do was incorporate bikes into the mix. He started offering bike repairs at the farm on the 7th line, but he kept thinking about opening a shop. When he saw the opportunity for a space on Trowbridge Street, just east of Sykes, he and Janet jumped at it. Ride on Bikes held its grand opening two weeks ago. Paul says his market is anyone who wants to ride and is still able to. “These bikes are perfect for people who maybe haven’t been on a bike for awhile or who aren’t comfortable on ordinary bikes, who maybe get sore backs or shoulders from riding,” he says. “These things are amazing. You can ride them forever.” Elektra’s “Flat Foot Technology” (or “crank-forward” design) means you can rest your feet on the ground while sitting in the saddle, but still get full leg extension and power when you pedal. Ride on Bikes rents the comfort bikes for $25 for a half day and $40 for a full day, and that includes a helmet, lock and bike trail map. And if you’ve ever wanted to try a “bicycle built for two”, you can rent the tandem for $15 an hour. 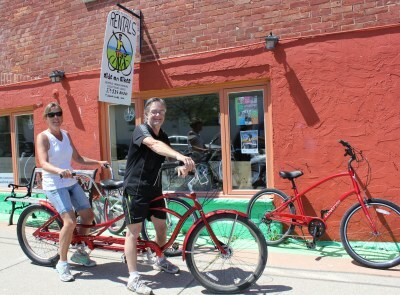 Janet Perks and Paul Bishop, of Meaford’s Ride on Bikes, try out the tandem. Paul plans on guiding some tours in the fall, but staff mechanic (and avid rider), Christian Lewin, is ready any time, says Paul. Christian is also working on a series of self-guided rides, with detailed maps and directions, called “Christian’s Picks”. 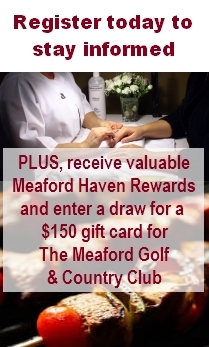 The Meaford Independent has published an article about the origins of Meaford Haven. It all stems from a drive Pierre Boiron took three summers ago along the southern shore of Georgian Bay. Passing through Meaford, Ontario he discovered both the town and the perfect location for an aging-in-place retirement community. It seems every generation laments the lack of physical fitness in its children. Back in the days before Xbox and YouTube, Catharine E. Beecher took Americans to task. Thus she introduced her attempt to remedy this situation. “Physiology and Calisthenics for Schools and Families”, published in 1871, prescribed a series of exercises to help American children, like the Greeks of ancient times, become “strong, healthful and beautiful”. 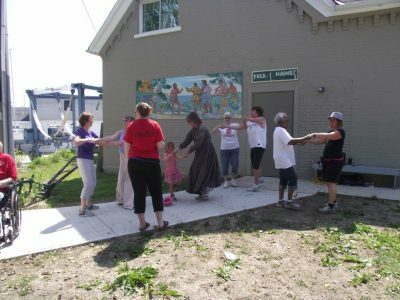 Yesterday at the Meaford Museum, Mary Solomon introduced some brave modern souls to these “calisthenics” during Meaford’s Longest Day of Play. When it came to leg exercises, Mary noted, the girls could do fewer repetitions. The heavy skirts of the 19th century meant they were doing twice the work of their male schoolmates. In this video, Mary and Sarah Naylor demonstrate some of the exercises. Hey, we didn’t know June was seniors’ month, but while looking up some information on tomorrow’s Seniors’ Fair at Owen Sound’s Harry Lumley Bayshore Community Centre, we discovered it really was seniors’ month in Ontario. Cool, a whole month! The 2013 theme, according to the Ontario Seniors’ Secretariat, is “The Art of Living”, which celebrates how seniors in Ontario create their own individual approaches to living. The Seniors’ Fair in Owen Sound features 69 exhibits and seminars, including a special appearance by entertainer (and senior) par excellence Dinah Christie, called “Old Enough to Know Better… And Yet She Doesn’t”. Doors open at 10, with Dinah’s presentation at 10:30. You’ll also have a chance to see presentations on fraud prevention and safe driving, and with 69 exhibits and additional entertainment, there’s lots to do. Came across a few encouraging thoughts on saving for and living in retirement this past week. To begin with, BMO reports that property tax deferral programs for seniors can free up more cash from your retirement income sources by allowing you to put off paying a portion of property taxes till a later date, such as when you sell your home. “It’s a great way for seniors to take advantage of the equity they have built in their homes and create more cash flow during their retirement years,” says Chris Buttigieg, Senior Manager, BMO Wealth Planning Group, BMO Financial Group. In Ontario, homeowners over the age of 65 can defer paying any increases in property taxes; however, they are still required to pay the base amount. 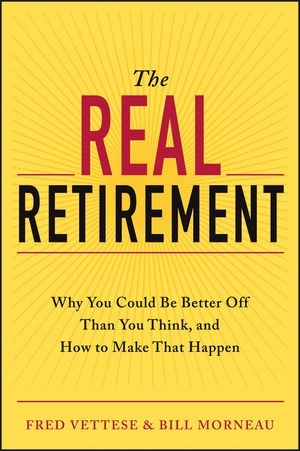 And a recent book by Fred Vettese and Bill Morneau, senior executives with Morneau Shepell – Canada’s largest administrator of pension and benefits plans – paints a rosier image of financial needs in retirement than we’ve been hearing elsewhere. Real Retirement: Why You Could Be Better Off Than You Think, and How To Make That Happen suggests that most people can get by quite well on half their pre-retirement income, rather than the 70 percent often cited. As barbecue season swings into full force, you’ll be pleased to know that among Meaford’s many amenities is a service you won’t find in every small town. Cutting Edge Meats, on Sykes Street, offers free range chicken, beef, pork and lamb, along with seafood and smoked foods, prepared by a third-generation butcher. But this butcher cuts great country songs along with great-tasting meat. For 20 years or so, Meaford residents enjoyed the services of Mark Young, resident butcher at The Sirloin Cellar. But when Mark and his wife, Debbie, retired and closed up shop at the end of 2009, meat lovers mourned the closing. Fortunately, they didn’t have to wait long. At the time, Michael Ruhl operated Cutting Edge Meats in Thornbury. He had begun to think about moving his shop to Meaford, but another goal tugged at his imagination. In 2010, he headed to Nashville to launch a country music career. He recorded an EP, played around town, and shot a music video in Saskatchewan, before returning back to the area and opening his new Meaford butcher shop last summer. Now, he works both careers – and sometimes combines them, as you’ll discover next Friday at the performance and pig roast supper at Meaford Hall. The evening begins at 5 p.m with cocktails on the patio at Meaford Hall, followed by a dinner featuring slow-roasted local pork prepared on Ruhl’s 18-foot barbecue. Then, at 8 p.m. Michael Rule (transformed into his stage name), takes to the stage to perform his personal brand of fresh alt-country music. For tickets, visit the box office online or at 12 Nelson Street East, or call 1.877.538.0463.